I'm more proud of this outfit than any other simply because I'm wearing so many older pieces from my closet. They're not so old that they look ratty but they're not new so I know I didn't "splurge" on anything (OK, except for the sneakers that I debuted here...). Remixing older pieces from the closet is not revolutionary but I love the challenge of changing up a look. 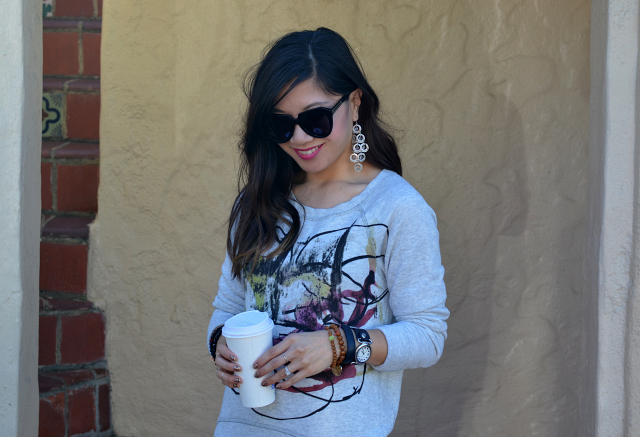 The glam factor of this skirt is mellowed by my sweatshirt and sneakers. I'm perpetually in love with contrasting glam and grunge and feminine and masculine pieces. It's the juxtaposition that makes it good. I love wearing skirts/dresses with sneakers. Its the ultimate comfy-cool outfit. And your sweater makes this outfit even more awesome! stunning! love the laid back sweater with the very glam skirt! You know I'm all about remixing older pieces from my wardrobe, so I love this :) That lipstick color looks stunning on you! I'm in love with your sweatshirt! And I love how you wore it with this skirt, such a great contrast! I love this combo of mixing hard with soft! The skirt is lovely, and mixed with the shoes and sweater just gives it that extra something special. You are adorable girl! Don't you love when that happens??? Makes you feel so resourceful huh? I love this look very much. The sneakers may be a new purchase, but I bet you will wear them all the time. I would! I think personal style is all about mixing your old stuff with your new. Cute shoes! So cute, nice combination ;) like your sneakers just now I posted a new fashion show very vintage, I invite you to visit my blog, and follow each other? I love creating outfits with my older pieces. Can I just say your hair is looking so fabulous in these pictures!! Love this more laid-back look, Nancy! Majorly jealous of that sweatshirt. Simply FABULOUS Nancy! I love the sparkle in your skirt and the print on that sweater. Looks gorgeous together. I love finding new ways to style my old clothing! And your shoes are the perfect addition to the outfit! Great style!! I'm in love with your skirt! Thank you for stopping by! I love this mix of casual and dressy, and those leopard sneakers are darling. This look is super chic and looks comfy. very glam grunge indeed. And I am totes digging those sneakers even though I'm not a particularly huge leopard person! Love this look, especially the sweater! perfect outfit! love it from head to toe! btw, I have a nice giveaway on my blog. You can win 100 $ to spend on sheinside.com. You can find all the details HERE. The contest ends on September, 22, I would be so happy if you joined! Oh ll you are right this is a great look I love the glam with the casual awesome job. I LOVE that skirt! And of course the leopard sneaks too. A very sophisticated mix of elegant and urban. Ahhh I love every single thing about this look. 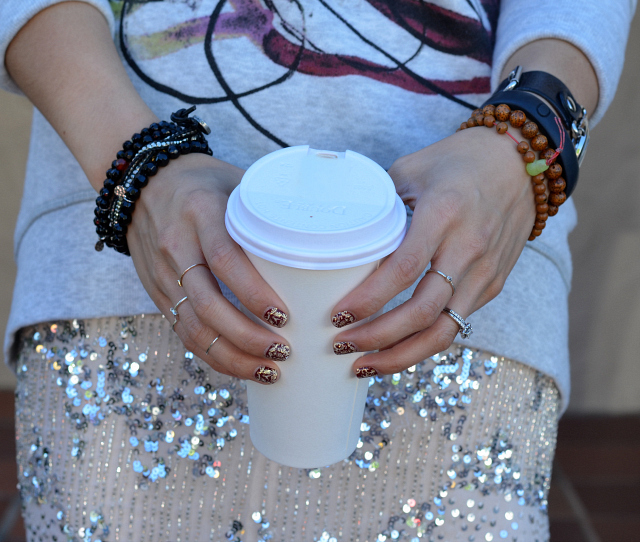 That sparkly skirt is perfectly paired with the sweatershirt. Love the mix of casual and dressy, and remixing is the best! Thank you so much for the sweet comment about my handmade jewelry! Made my day. You look fabulous! I am definitely not creative enough to put such a masterpiece together. You do it so well! wow! great outfit! and your nails are fabulous! Perfect look, I love how you paired a basic item with a shiny, luxurious one! i love this mix of glam and casual! i am pretty sure i need those shoes! I've got this same sweatshirt- I LOVE it! So comfy! Love this outfit by mixing pieces of different styles. Nails are gorgeous!!! Gorgeous skirt - I love that you paired it with a casual sweater. I love your style. simple and cute. great outfit! the skirt is gorgeous! This outfit really suits you! I love jumper and skirt combos and your nails are beautiful! You look fab and edgy, but still comfy in your outfit! I love those chandelier earrings too! aka The Belated Bloomer - Blog Giveaway Still Open! love the sweater and shoes together! xO! i loooove that sweatshirt, you look awesome and fun! What a fun outfit - your outfit is a mismatch, but together it all totally works. And I love that first pic of you! Followed! Care to follow back?Thanks! I like the skirt paired with the leopard print sneakers it's a really fun combo!